It looks like D.B. Cooper got away with it. The F.B.I. is putting an “inactive” stamp on the files for the country’s only unsolved hijacking. It’s not like they didn’t try. Since November 24, 1971, the F.B.I. has been trying to figure out how a man calling himself Dan Cooper parachuted out of a Northwest Orient plane somewhere over southwest Washington State with $200,000 in twenty-dollar bills – and was never seen again. On the afternoon of November 24, 1971, a nondescript man calling himself Dan Cooper approached the counter of Northwest Orient Airlines in Portland, Oregon. He used cash to buy a one-way ticket on Flight #305, bound for Seattle,Washington. Thus began one of the great unsolved mysteries in FBI history. Cooper was a quiet man who appeared to be in his mid-40s, wearing a business suit with a black tie and white shirt. He ordered a drink—bourbon and soda—while the flight was waiting to take off. A short time after 3:00 p.m., he handed the stewardess a note indicating that he had a bomb in his briefcase and wanted her to sit with him. The stunned stewardess did as she was told. Opening a cheap attaché case, Cooper showed her a glimpse of a mass of wires and red colored sticks and demanded that she write down what he told her. Soon, she was walking a new note to the captain of the plane that demanded four parachutes and $200,000 in twenty-dollar bills. When the flight landed in Seattle, the hijacker exchanged the flight’s 36 passengers for the money and parachutes. Cooper kept several crew members, and the plane took off again, ordered to set a course for Mexico City. Somewhere between Seattle and Reno, a little after 8:00 p.m., the hijacker did the incredible: He jumped out of the back of the plane with a parachute and the ransom money. The pilots landed safely, but Cooper disappeared into the night—and his ultimate fate remains a mystery to this day. Clues – even some of the money – have been found and studied over the years, but the D.C. Cooper caper has never been solved – to the delight of those who gather in Ariel, Washington each year to celebrate the one that got away. Here’s a link to a story I did about that party for National Public Radio back in 2008. And, in case you’d like to try to solve the case, here are some of the clues. It may be another 40 years before before the FBI solves the D.B. Cooper caper, but federal agents aren’t willing to give up. Back in 1971, a man who bought a ticket under the name Dan Cooper hijacked a plane flying from Portland to Seattle and demanded a flight to Mexico, four parachutes – and $200,000. Cooper bailed out somewhere over southwest Washington – and disappeared. Along with most all of that money. All these years, the FBI has following leads but has been unable to crack the case. Now they’re giving it another try. The suspect has been dead quite a while, but it would nice to put this unsolved mystery to rest. If the case was solved, then the folks who gather every year at a bar in Ariel, Washington for their annual party in honor of Cooper would have to find something else to drink to. 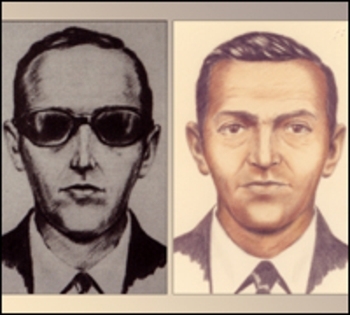 Take a listen to my story about the party, “Whatever happened to DB Cooper” that aired a few years back on National Public Radio. There are some intriguing theories floating around out there…. Whatever happened to D.B. Cooper? D.B. Cooper was one guy who wasn’t going to get stuck at the airport. Back in 1971, he hijacked a plane flying from Portland to Seattle and demanded a flight to Mexico, four parachutes – and $200,000. Cooper bailed out somewhere over southwest Washington – and disappeared. Over the weekend, folks in Ariel, Washington gathered for their annual party in honor of Cooper – and the country’s most famous unsolved hijacking. Take a listen to my story about the party, “Whatever happened to DB Cooper” that aired this morning on NPR. There are some intriguing theories floating around out there…. The FBI sketch of D.C. Cooper. Have you seen him?? ?